It is a day when Australians and New Zealanders think about war and the people who have served; the people who have fallen and what it means to serve your country. There is honour in that. There is a sense of nobility too. It’s not a time to talk about whether war is right or wrong. It’s a time to remember, to give thanks. It’s a time to be proud. The ANZAC spirit, the brotherhood, the camaraderie, it endures. On a day like today I can feel it in the air; it is unseen but clear and real. On a day like today I watch men and women in dress uniform marching through the streets of my city, their hearts swelling for those who came before and those who will come after. Marching for brave souls and freedom and peace. And my heart swells too. Absolutely. We can’t ever forget the dear Anzacs. Australia Day marks the day when the fife and drum began to supplant the didgeridoo. There are many of us for whom that is not a day to celebrate. It was not until war brought Catholic, Protestant, Muslim, Maori, Pakeha and Koori, men and women together in a common cause that our bonds were forged. To me, it is unfortunate that it took the horrors of war to define our identity and give it a name. But despite its beginnings, we no longer gather together only to honour our war dead. In the absence of any other, we have grabbed this day to celebrate our tribe. The tribe of the ANZACS. You raise a very good point and it is unfortunate that war, to a certain extent, has forged our national identity but the fortunate side of it (as you say) is that as a result we no longer gather on this day just to honour our war dead. I feel part of a tribe on this day, for sure. And that’s a good thing! It was so good to see all the thousands of people out not only for the Dawn Service, but the march as well, and all the kids that marched for their Grandfathers proudly wearing their medals. We must never forget the thousands that lost their lives fighting for our Country. I was so proud to see all the Sydneysiders watching the parade in the rain. That made me feel really good. I think it just goes to show that the ANZACS mean a lot to all of us! The older I get, the younger the soldiers get whom we send to war. We have rememberance day here in November, sounds like the same kinda thing, honoring the men and women who fought for and died for our respective countries. But I’m not sure what anzacs are… guess I’m off to google it to find out. Your description of the ANZAC spirit was very moving. Last night, I talked to a man who honors US veterans in a wonderful way. Three times a year, his organization flies WWII vets (men and women) to the WWII Memorial in Washington. Every trip, there are fewer of them, and there aren’t many left now. He said that this trip is typically “the last hurrah” for these people. We don’t say thank you often enough. Amen, Selma! God Bless the ANZACS. It is very true. And that is one of the harder things to swallow. It’s like watching your own child go to war. My heart goes out to any Mum or Dad who has to do that. It is similar to Remembrance Day. 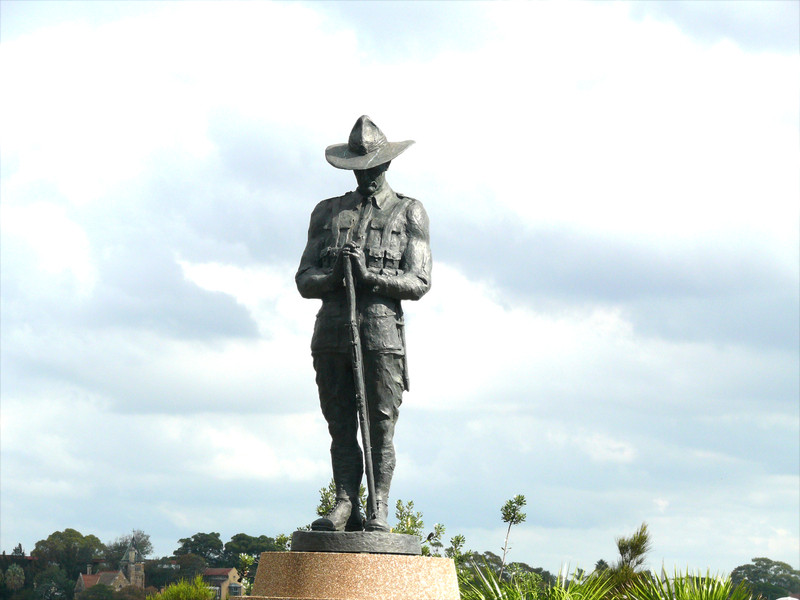 The Anzacs are the Australian and New Zealand troops who served initially in the First World War but since then have become almost legendary in the minds of the people. It is heartwarming to see how many people want to pay tribute to them. It’s sad when there are less and less of the orginal vets left. There are no original Anzacs left now and it is a sad thing to think about. You are so right – we definitely don’t say thank you enough. I am so glad you stopped by, Patti. Lovely to meet you. They were great, great men! Your post is great…. the comments are just as interesting…! My father was a Naval Officer and I am proud of what he did for our country…. it takes so much courage to stand up for what you believe in… no matter who you are! Bless them indeed. I always feel similarly moved by our Remembrance Day. Let’s never forget. It really does take courage to stand up for what we believe in. You must be so proud of your father. What a wondertful man! It moves me so much. Sometimes I cry when I watch the parade. I don’t really know why. I will never forget….